Time Out New York described SOMETHING ROTTEN! as “Broadway’s Funniest Musical Comedy in at Least 400 Years!”, a description that perfectly captures the humor and charm surrounding this hit musical. The hilarious new show owes its wit and energy to director Casey Nicholaw, the man behind Broadway hits like The Book of Mormon and Aladdin. As the director and choreographer, Nicholaw is responsible for the huge production numbers and rousing laughs that make SOMETHING ROTTEN! the perfect Broadway smash. In this interview Nicholaw explains how the show became a “love letter to musical theatre” and what makes this original musical so special. Q. What made you decide to say yes to SOMETHING ROTTEN!? Was it because of Kevin McCollum’s [producer] involvement and the potential you saw in the material? A. It sort of started with Kevin, just because of our relationship, and then we met with Karey [Kirkpatrick, book, music & lyrics] and Wayne [Kirkkpatrick, music & lyrics] and John [O’Farrell, book], and they sort of knew what they were going to do, but it wasn’t written yet. I saw three songs and two scenes. But I loved their take, and they were so passionate about it, so I said, “Sign me up.” I loved the idea of the story and where it could go. Q. These three guys are all incredibly experienced in other fields, but they were new to Broadway and musical theater, so how did you work with them? They all said they felt they got a graduate school education working with you. How did you make them understand the particulars of the craft? A. They’re complete musical theater nerds anyway. So they already loved it and were very well versed in all of it. They had to learn the nuts and bolts of things, but their instincts were really good. Q. Any time they were writing a song that didn’t further the show, that might have been a great song, you had to break that to them? A. Absolutely. The show really developed its personality as the four of us got together and started playing around. Q. Tell us about the creation of the the number “A Musical”? It’s so much fun, a showstopper. How did you figure out the form it needed to take, and how did you give it so much impact and make it so delightful for the rest of us musical theater nerds? A. I knew it had to build and build and build. It was all sort of there in the form. It was talking about the form as the form was happening. When Glen Kelly, our dance arranger, went to town – I’ve worked with him on a bunch of shows now, and when we started in pre-production, he’ll go away and start writing dance music. He’s the one who came back with all the references. I really wasn’t sure at first, I thought it might be too in-jokey. But once we started playing with it, the dancers were like, “Oh my god, are you kidding? We have to do this.” It ended up working well. Q. It’s truly amazing. When you hear that little snippet from another show, or you see a particular kind of dance move that’s instantly a signature of another choreographer, it’s just brilliant. A. Yeah, it’s fun. It’s funny too. The only time we do that in the show is in Nostradamus’ stuff, because he’s seeing the future. So that makes it OK.
Q. How do you feel about the way Shakespeare is portrayed in the show? He’s very amusing, but the rock star and comic villain of the piece. A. Absolutely. I think it fits perfectly. You have to have someone be the villain, so why not have it be Shakespeare? Q. What do you think the particular gifts are that Wayne and Karey and John bring to their work as composers and writers of dialogue? A. I just think they’re funny, and that’s the most important thing. They’re clever. Their lyrics are really good. They’re very talented, but funny trumps everything. Q. What would you say are some of the particular challenges of creating a wholly original musical, as you did with Book of Mormon and SOMETHING ROTTEN!, vs. doing a musical based on other source material? A. It’s kind of more fun, because you can go anywhere with it. With an original show, you don’t have the restrictions of something already created, you don’t have something to follow. You always seem to get to a place in Act Two where you’re going, “Oh my god. What happens now?” Or, “We need a scene to get us to the end.” It always feels like it’s the same place. Q. Were there any numbers that you really loved but felt just didn’t work for the show? A. Oh, yeah. There was a ballad we had in Act Two which was gorgeous, called Lovely Love. It was between Nick and Bea, and Nigel and Portia. It was a quartet. It started out as Bea’s song, then one by one the others joined in. It just didn’t work there. We did it into previews. We cut it probably two weeks into previews. It was painful for everyone. Q. How do you decide which projects to say yes to? A. Each one has its own different thing. But for me, it has to be smart writing. That’s the most important thing, because it’s also easier to stage. Something that has a buoyancy to it, and also a lot of heart. That’s what I like most. Q. What would you say to people coming to the show who might not know much about Shakespeare and musical theater? A. I think it doesn’t matter how much you know. I know so many people who don’t know much about musicals who say they had the best time. My nieces and nephews say it’s their favorite show that I’ve done. They don’t know any of the references. You shouldn’t underestimate audiences. They see the funny in it. 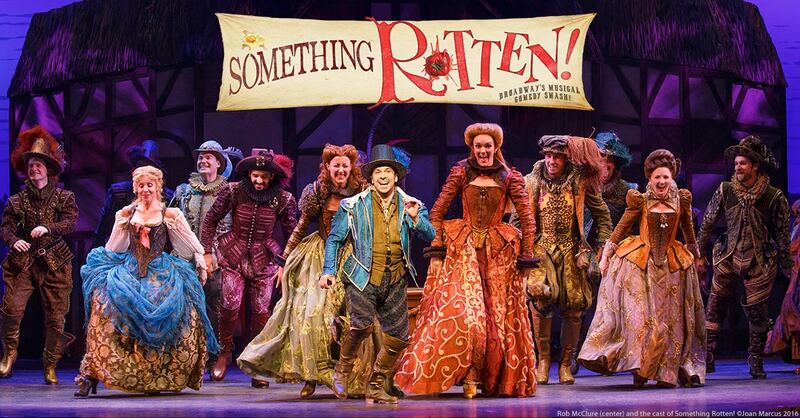 Don't miss SOMETHING ROTTEN! at the Fabulous Fox February 7-19! Tickets are available now at FabulousFox.com/Rotten!